Did you like Perfect Chemistry by Simone Elkeles? Or anything else Simone has written? Did you like Katie McGarry's books? If so, you will love Wild Cards. 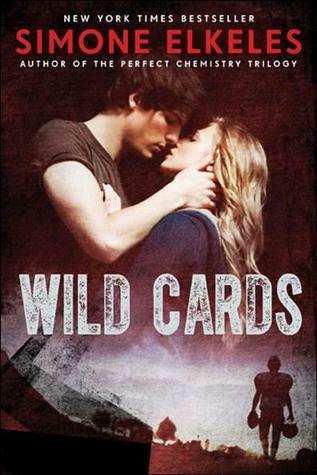 Wild Cards is a hot, edgy romance between two hard edged characters. It's a light book. I don't mean light as in cute or funny, rather that it's like candy. It's a great read on a surface level, but I got frustrated if I went deeper. That's how I generally react to edgy romances of this kind. Derek wants us to think that he's a bad boy. He puts up a snarky, tough front, he got kicked out of his boarding school. But really he's a sweet softie. He got kicked out of his school for a hilarious prank that the jerk principal overreacted to. He has a strong sense of justice, he's devastated by the death of his mother. Plus, he's adorable with his little 5 year old brother (step-brother or half-brother, I can't remember). Derek is immediately likable and he was the highlight of this book for me. I wasn't as much a fan of Ashtyn. I felt bad for her. She's desperate for attention from her neglectful father, so she went out for football to gain his respect. And even that backfired. She's a talented and ambitious football player. But I had trouble reconciling her supposed toughness as a football player with how weak she often seemed. Especially around her awful ex-boyfriend. It's like she's going out of her way to be the stereotypical female and the football player at the same time. Maybe I've been influenced too much by Catching Jordan and Dairy Queen, but she didn't seem believable to me as a girl tough enough to play football in a male-dominant world. As awful as this sounds, I thought she was too much of a "girl." That said, it's hard not to be sucked in by Ashtyn and Derek's immediate connection. Not insta-love - chemistry. Their conscious dislike for each other masked their subconscious attraction. The hard-edged banter was hilarious. Especially on Derek's end. And of course the romance is steamy, much like I remember Perfect Chemistry being. Simone excels in getting her characters almost there and then stopping. Nothing like ratcheting up the tension and the uncontrollable urge to flip pages. The breaks felt realistic though. The characters - mostly Derek - purposely did or said something outrageous to stop themselves from doing what they really wanted to do. Their baggage and fears got in the way. Wild Cards is a good book. It fulfills every spot on the edgy romance checklist. I like edgy romance, but it's not my favorite genre. So I liked this well enough, but not as much as many other readers. But knowing enough about the genre on an objective level, I think it's a great read. Yeah, the balance of a tough football player with acting weak off the field just doesn't seem to fit. I think I'd get frustrated with her, too. But I'm still all over this hot love story! I loved this book. It's a signature Simone Elkeles. You gave it a try though, even if it's not your genre. Hmm, I had a feeling about this. But this be a type a book that I can read without getting so into it. It perfect just to enjoy. I'm still want to give it a try. Lovely review. I had a similar reaction to this one Alison! I liked Derek quite a bit, but I ran into trouble with Ashtyn. She just did some things that didn't make sense to me, and while I felt so awful for her when she went to the camp, I couldn't quite get past certain choices. I adored Derek and his grandmother though! I loved this one a little more than you did and I also seemed to have no problems with Ash. However, I do get your points and it might be that Ash is not the girl for everyone. "It's a great read on a surface level, but I got frustrated if I went deeper." --> This is exactly how I felt reading the author's older titles. It felt like a half baked story that just focused on the romance rather than the serious issues. I love, love, love Katie McGarry, but I'm not madly in love with Simone Elkeles. Of course, I've only ever read Perfect Chemistry, which I thought was good, but not anything near as amazing as Pushing the Limits or Dare You To. In my opinion, of course. But I am curious about this book, so I should give it a try. I just finished this book last night! I really liked Derek, but Ashtyn was only ok for me. I am definitely going to check out more books by Elkeles! Great review. This is pretty much exactly what I'm expecting from this. Entertaining, not too deep. I did really enjoy Perfect Chemistry so I hope I like this too.